It wouldn’t be summer without my favorite, most foolproof Beer Brats recipe ever, straight from the Midwest. After all, when something is so easy to make and tastes so darn good, yeah sure you betcha, I’ll be making Wisconsin Beer Brats every chance I get. What are Wisconsin Beer Brats? Beer brats are juicy bratwursts that have been cooked in beer and then browned with onions, served on a bun with all the toppings. 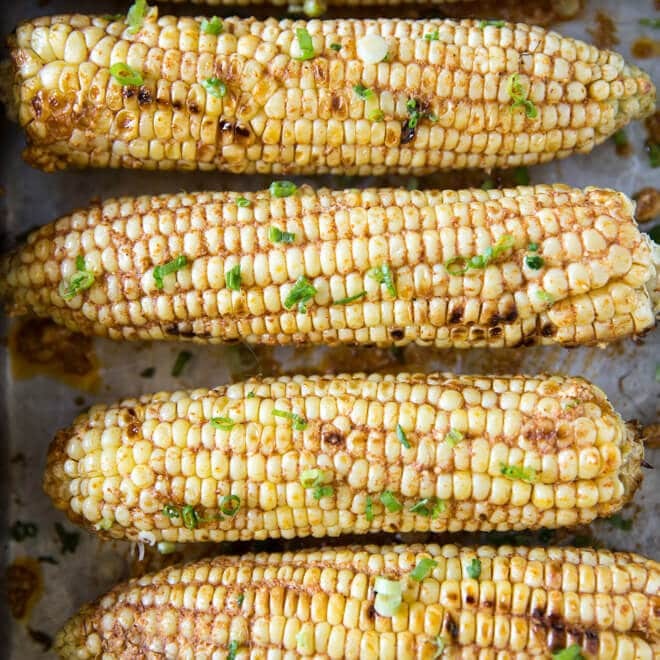 Making them is a time-honored Midwestern tradition, and no summer barbecue or tailgate party would be complete without them. It’s one of the many things Wisconsinites do best! How do you make Wisconsin Beer Brats? This recipe is the classic version for the juiciest, most flavorful brats ever. I boil the brats on the stove in a mixture of beer and water, then I add some sliced onions and a pinch of chili flakes. When the brats are cooked through, I brown them up in a pan or on the grill. Can Beer Brats be made ahead of time? Yep, and in fact, I boil up the bratwursts the night before to save time, and brown them on the grill when I’m ready to serve them. What are the best brats for Wisconsin Beer Brats? Always start with raw bratwursts, not those pre-cooked monstrosities. Basic grocery brats are just fine, but if you have a good butcher, you might try out one of their small batch brats, as well. You might find end up with an award winning bratwurst. What beer do you use for Beer Brats? Whatever you got! If you have to shop for beer, a traditional lager works well. Some swear by IPA, while yet others insist on stout. It all depends on what beer you like the best, because you’ll probably be drinking the leftovers. How much beer do you use to make Beer Brats? I use one 12 ounce can for every 5-6 bratwursts. 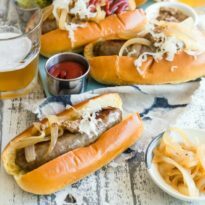 Can you cook Wisconsin Beer Brats in a slow cooker? For parties where guests will be showing up over a long period of time, Wisconsin Beer Brats can be cooked in a crock pot and kept warm until ready to serve. I recommend doing things in a slightly reverse order, though. First, I brown the brats in a pan, then place them in the slow cooker with all the other ingredients. Cook for 4 hours on high, or 7-8 on low. What do you put on Beer Brats? For fun and so that everyone can make their own brat just the way they like, I create a topping bar with sauerkraut, onions, relish, pickles, ketchup, and a couple different mild and spicy mustards. Can Wisconsin Beer Brats be made without beer? If you are looking for a way to make Wisconsin Beer Brats without beer, substitute ginger ale in its place. 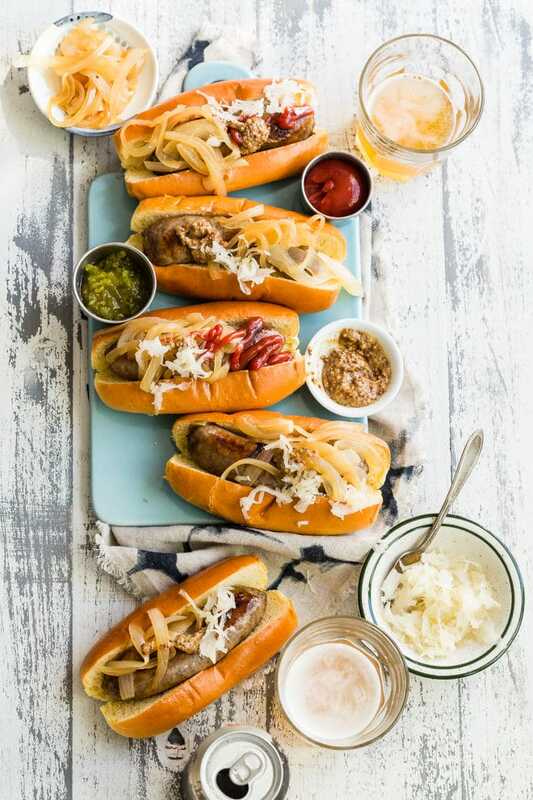 What do you serve with Beer Brats? For side dishes, I’ll make my grandma’s best Macaroni Salad, Piggly Wiggly salad, or Calico Beans. And I always make a huge batch of Cowboy Caviar! 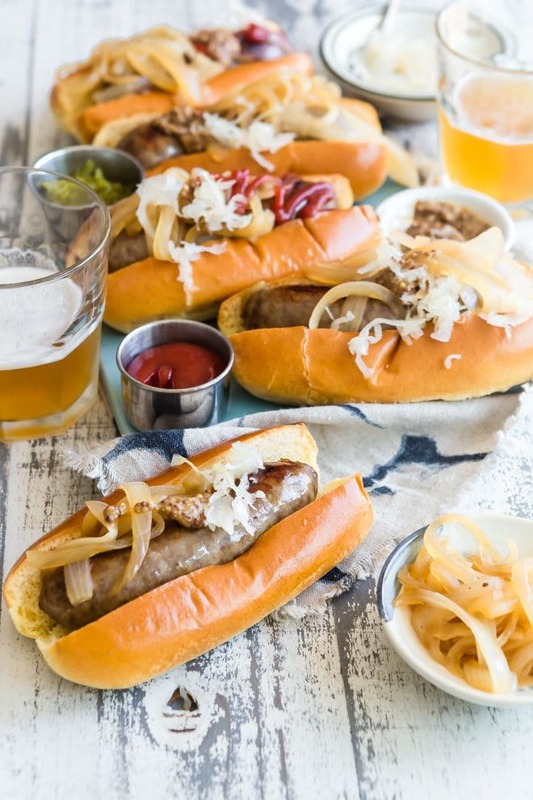 Save these Wisconsin Beer Brats to your “Main Dishes” Pinterest board! Preheat grill over medium-high heat. Clean and oil grate. In a large pot over medium-high heat, add brats, onion, red chili flakes (if using) and beer. Bring to a boil, reduce heat, and simmer until brats are cooked through, about 10 to 12 minutes. 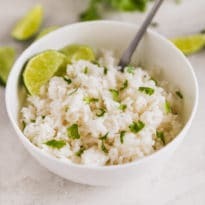 Remove brats to a bowl or platter. Continue cooking onions in beer while grilling the brats (use as a topping if desired). Increase heat to medium and cook brats, turning frequently, until browned, about 5 minutes. 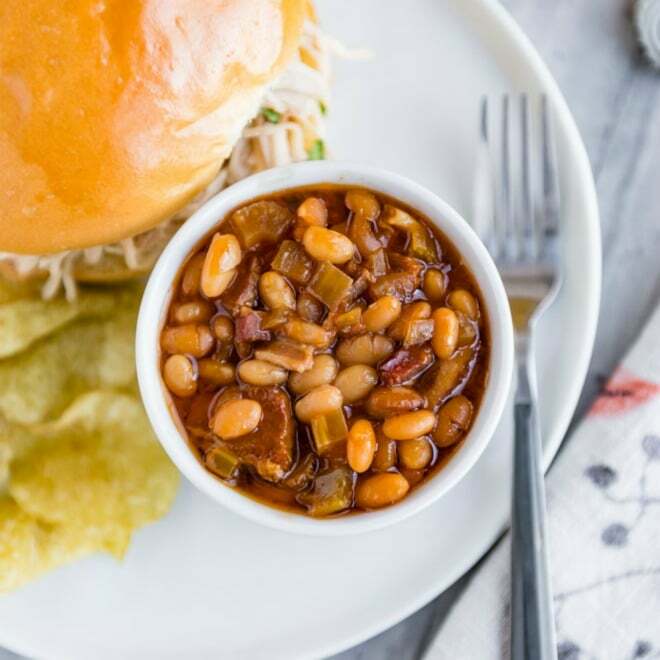 Serve in buns with your favorite toppings. I think most of us Wisconsinites would say the best beer isn’t what you’ve got “on hand,” but what you’ve already got IN your hand! :) The brats really are best grilled over charcoal – nothing beats that WI backyard, by the lake, Brewers tail-gait flavor. Prost! 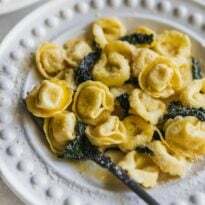 I LOVE the idea of adding mushrooms! And horseradish. Fantastic! What do you do with the cooked onions? Serve as a topping? Hi Laura, you can either use them as a topping or you can discard them. I love the cooked onions on brats, but some people (my dad and brother come to mind) prefer raw ones, so I usually serve diced raw onions on the side, too. Just now reading this. My family does it in reverse…we cook the brats first and then put them in a crock pot (or sweet d5 pan) with beer, butter, and onions on low. Simmer for a few hours and you’re good to go. I’m with you Joey! Those of us from Wisconsin, cook them up on the grill till they are good and brown and done. Then we put them in beer with plenty of sliced onions. And of course, you need to have Sheboygan brats!! They are the best. Put 2 of them on a hard roll with the toppings of your choice and enjoy. We grill brats out all winter in Wisconsin…. Can I boil them first and refrigerate overnight? Grill them the up the next day? YES! That is how we allllllways do it. Always. 100% of the time. I will add that info to the recipe, thank you so much for reminding me Alicia! Megan do you leave them cool in the beer and then refrigerate, or remove them from beer right away? Just wondering which will keep them juicer. We preboil, freeze then take them camping. Over the fire is best! Please, Would you share your cheese sauce from the cooked beer brauts. It sounds really good, I’ve never had it, seen it or heard of it, so I’m not even sure where to start experimenting. Did you remove your recipe for Wisconsin-Style Jambalaya? I had it pinned and it keeps bringing me back to this recipe. Same when I google it. It was such a good recipe. Thank you! I’d bought the ingredients and was disappointed when I couldn’t find the recipe. Megan do you leave the brats cool in the beer and then refrigerate, or remove them from beer right away? Just wondering which will keep them juicer. We preboil, freeze then take them camping. Over the fire is best! What if you don’t drink what can you use instead of the beer can I use sparkling water or just omit it. Hi Veronica, Ginger ale makes a nice substitute for beer. You could also use sparkling water or just regular water. Thanks! Wow! I’m never making another brat unless it’s this recipe, thanks for sharing! I wasn’t really sure what kind of beer to use so I went with something cheap (Budweiser), but when I was done I couldn’t help but wonder if a better beer would make it even more delicious – like an IPA or something. What are your thoughts?